It’s late on a summer’s evening and I’m cycling homeward along one of the most beautiful country roads in England. This morning’s London to Brighton bike ride is well behind me now and I’m rolling towards the sunset on the longest day of the year. Eighty miles are in my legs by the time I pass the pretty Saxon village of Slinfold, with twenty more ahead to Guildford. Beyond the church, I slowly climb a steady rise and turn right onto the main A29. One of my favourite cycling stretches, this — perfect blacktop, arrow straight, and for now at least, heading gently downhill towards the river. This is Stane Street — the Roman road from Chichester to London. Built in the 1st Century AD, it’s more than good enough for me now. I pause to eat and think at the bridge across the Arun. Here, inside the meander of the river, the Romans built a staging post or mansio. Set around fifteen miles apart, these settlements offered a place for soldiers and travellers to stop and rest the horses, just as I am now. Aerial photographs show a rectangular enclosure — maybe once a fort, while geophysical surveys have revealed evidence of a string of houses set tight beside the road. This place, Alfoldean, lies halfway on the 70 mile route from the coast to London. Further north on Stane Street, Roman settlements probably existed on either side of the Chalk Downs around the crossing of the River Mole at Dorking and beside the spring at Ewell. 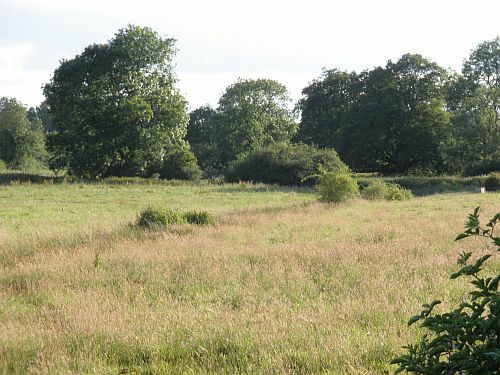 In a similar way, Alfoldean was sited at the spot where the road crossed the River Arun as it headed north from the open, rolling plains of Sussex into rougher country amongst the Surrey Hills. Ahead beyond the river lies a steep bluff where the legions had to climb steeply between the trees. On the map today that spot is still known as Roman Woods. Ten minutes later, I’m rolling westwards once again. The River Arun is on my left now as the A281 to Guildford heads arrow straight to Rudgwick, then turning right up a slow and steady haul to Alfold. I’ve found no reference to this as a Roman road, but the relentless up and downs seem diagnostic to my tired legs, and the bearing of the road heads for Chiddingfold Roman villa, ten miles south of Guildford. On another day, a few months later, I cycle west from work in Horsham for a midday foray along Stane Street. The A29 northeast from Billingshurst is as perfect for a lunchtime burn as I remember it, with only a short, steep rise along the ancient High Street requiring a shorter gear. I return to Alfoldean with fresher legs this time, and stash the bike for a closer look at Stane Street’s hidden rise through Roman Woods. 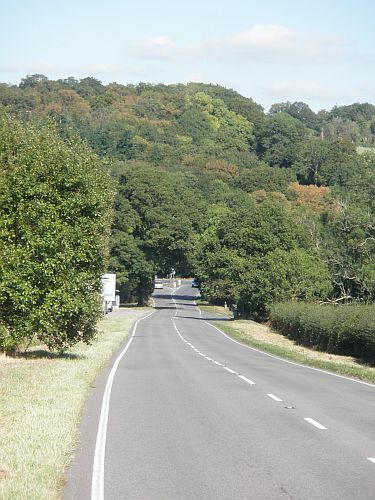 The modern A29 bypasses the hill here, forking right instead at the Roman Gate roundabout to rejoin the route of Stane Street further north near Ockley. I used to drive past here each morning, and to the car traveller there’s little sign visible of the old road north of Roman Gate. 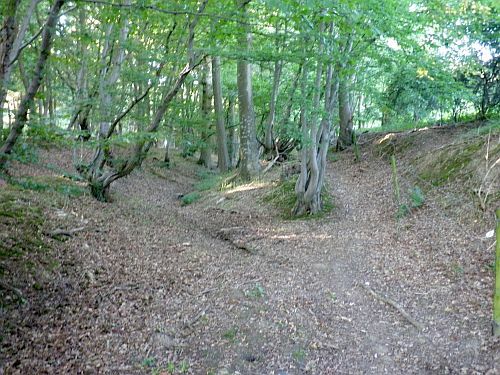 But on foot, amongst the trees, a treasure trove is revealed — a 2,000 year-old sunken lane with accompanying ditches and aggers running parallel for much of the way. I follow northeast, Londonwards, for a kilometre or so in the footsteps of the legions until I reach the hamlet of Rowhook, set atop the bluff. 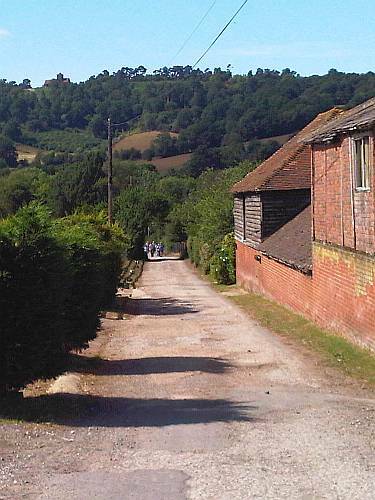 From here, a spur leaves Stane Street to head northwest towards the Surrey Hills. A summer’s morning high in ancient forest. Atop the longest, steepest climb of all, at the end of Barhatch Lane, I turn left and seek the Roman Road once more. It doesn’t take long to find it. At a clearing in the trees, I see a narrow valley rising to meet Winterfold Lane. 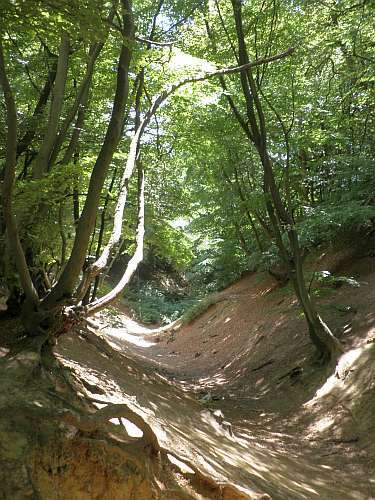 I’ve cycled here a dozen times before, but now I see that this valley, Jelley’s Hollow, is as tight and steep as any sunken lane in Surrey — worn deep into soft Greensand across the centuries by countless feet and wheels. Only this one has no modern lane within it — instead it’s the route of the ancient Roman road, forged through the rough country of these wooded hills. Across the lane, the route tracks northwestwards through the forest towards the Roman temple at Farley Heath. Did the Roman road end here, or carry on towards Guildford? 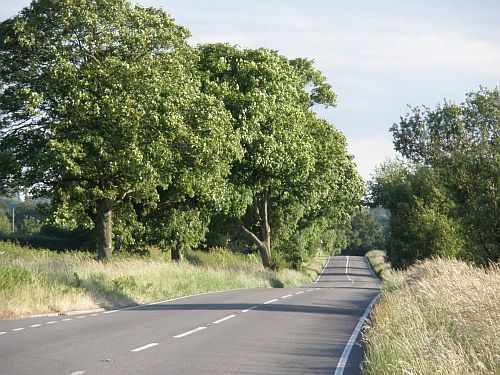 No evidence is recorded either way, although a possible continuation across St Martha’s Hill and then to Burpham and Bagshot beyond has been proposed. But the soft sands of Blackheath and St Martha’s may not preserve many traces. 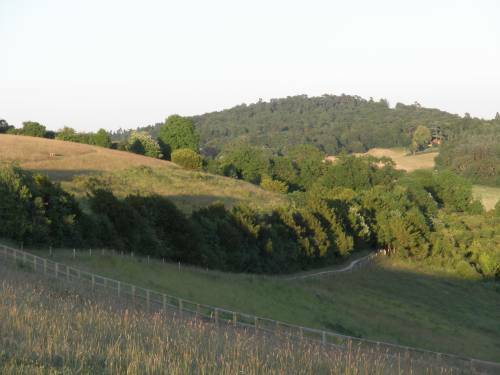 Late evening, on a different day, I cycle west from Albury, turning right onto the Downs Link path at Chilworth. The alignment of this track through Lockner Farm is perfect for a continuation of the Roman road — but did it really climb the steep south slope of St Martha? Perhaps it did — there’s a modern, twisting path ahead floored with flints and rubble which I’ve run breathlessly towards the summit on hot summer days far more energetic than this. Today I head more languidly across the bridge, through the Gunpowder Mills on the shady path beside the river and homeward across the hills. Back home I consult the local maps, and search satellite images for clues which might not show themselves readily on the ground. Eventually, I see it — a straight line from Chilworth to a fording place across the Tilling Bourne, then striking left along the southern flank of St Martha’s Hill. The line of a sandy track sets a course for the pass on Halfpenny Lane, the alignment continuing arrow straight on a forest track through The Chantries and onwards along my old favourite, Mile Path, to crest the chalk ridge at Pewley Down near a patch of pebbles right atop the ridge. From there it’s an arrow straight continuation down Pewley Hill and beside the Norman castle to reach the River Wey at the fording place below Town Bridge. Was this a main Roman route, or the fork of a fork off Stane Street? It’s hard to say — the development of the town of Guildford and the sandy soils above the Paleocene strata beyond make it difficult to follow further. But the alignment is perfect — a continuation on this bearing leads northwestwards to Calleva, the important Roman town of Silchester now lying peacefully abandoned amidst Hampshire fields over twentyfive miles away. I once ran along the Devil’s Highway, a famous stretch of the Roman road from Silchester to London set deep in Bracknell Forest. But I didn’t realise I ran a Roman route across the Downs almost every single week. This entry was posted in 2010, cycling, Guildford, history, summer, Surrey and Sussex. Bookmark the permalink. I had a quick look at your hypothesis. Not a lot to say really; it’s just speculation. 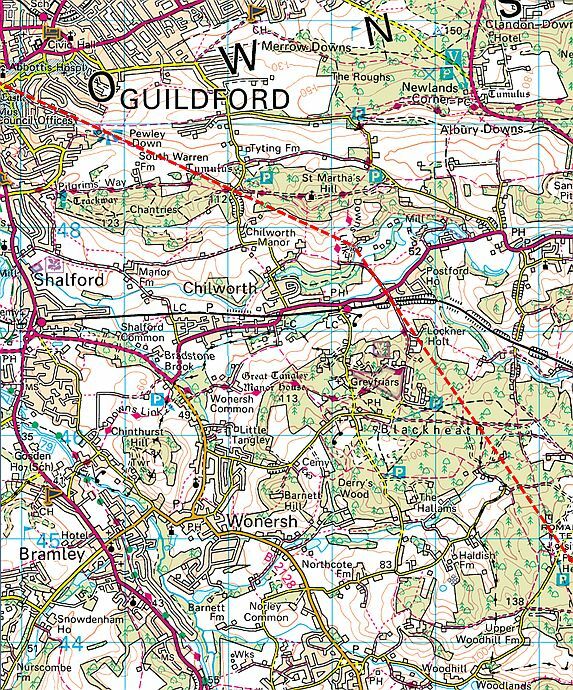 I’ve done it myself with the map, and the old route over the top and down into Guildford is one of a number of possible lines for a continuation of the Farley Heath spur. If it went anywhere then Staines or Wickham Bushes are the most likely destinations. 2) near Stane Street at Alfoldean Bridge – man reaching fig tree.